2.7.1 Telling the time is an important life skill in any language – and English is no different. We need to know what time it is so that we’re not late for class or work; so we don’t miss our favourite TV show or an appointment with a friend or colleague; so we don’t miss the train or bus and get home on time. 2.7.2 We tell the time in English, not say the time. How could you be on time for your English class without a watch (wrist) or a clock (wall/phone)? We can ask: What’s the time? What time is it? or Have you got the time, please? To reply, we use it is… or it’s… We can say It’s time for + noun, e.g. It’s time for lunch. Or It’s time to + verb, e.g. It’s time to begin. 2.7.3 There are two ways of telling the time in English: saying two numbers together (10.40 = It’s ten forty), or using past and to (10.40 = It’s twenty to eleven). The easiest method is to say two numbers. We use past when the time is between 01 and 30, and to when the time is between 31 and 59. We only use o’clock when the time is on the hour: It’s ten o’clock. We count time on a clock in intervals of 5 minutes. 2.7.4 If the number of minutes past or to is odd, e.g. 6 or 19, we say minutes, e.g. 2:19 = It’s nineteen minutes past two. If the time is between 01 and 09 minutes past, we use the word oh, e.g. 7.08 = seven oh eight. Or we could say: It’s about / around / nearly ten past seven. 2.7.5 We don’t use the 24-hour clock in everyday speech or writing, e.g. it’s fourteen o’clock, but we may need to read it when we look at a bus, train, plane timetable. However, we can use am (night & morning: 12.00am – 11.59am) and pm (afternoon, evening & night: 12.00pm – 11.50pm) to state which time period we mean. Usually the context makes am and pm redundant, e.g. ‘Your next lesson is at 3 o’clock on Tuesday.’ It is very unlikely for the lesson to be at 3am! 12pm = midday while 12am = midnight. 2.7.6 A second is the smallest common unit of time. There are 60 seconds in a minute; 60 minutes in an hour; 24 hours in a day; 2 days (Saturday and Sunday) in a weekend; 7 days in a week; 2 weeks in a fortnight; 28, 29, 30, or 31 days in a month; 3 months in a quarter; 12 months or 365 days in a year; 366 days in a leap year; 10 years in a decade; 25 years in a generation; 100 years in a century; and 1,000 years in a millennium. 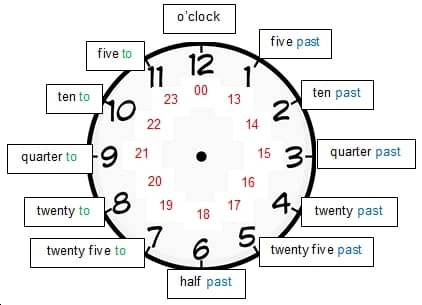 2.7.7 Time and prepositions: we say on + day (on Monday), in + month or year (in June; in 2016), and at for specific times (at 4 o’clock) and time periods (at the weekend). 2.7.8 Here are some common idioms connected with time: I can be on time for my lesson; spend time with a friend; kill time doing something trivial while waiting; have time for an activity; have a whale of a time or have the time of my life at an amazing party. That’s because time flies when you’re having fun – it goes quickly when you are not aware of it – but drags when you are clock-watching – counting the time until something boring ends. Here is a printable blank clocks template which you can photocopy and use to make your own clocks exercises: blank-clocks-template. Ex. 2.7.7 Writing How long do I need to wait, if…. Ex. 2.7.8 Writing What time is it now, if…. Which is faster, a nanosecond or a millisecond? Which is faster, a millisecond or a microsecond? How many milliseconds are there in a second? How many seconds are there in five minutes? How many minutes are there in a quarter of an hour? How many seconds are there in two hours? How many minutes are there in a day? How many hours are there in one week? How many minutes are there in a fortnight? How many days are there in a calendar month? How many days are there in a lunar month? How many days are there in a standard year? How many hours are there in a leap year? How many years are there in a generation? How many years are there in four decades? How many years are there in a couple of centuries? What time does the 15:51 bus from Timberley arrive in Champerdon? What time does the first bus in the morning leave Timberley? What time does the 14:10 bus from Markham arrive in Holden Bridge? What time does the 08:15 bus from Markham arrive in Timberley? Which route is the longest? How many minutes does it take? How long does the number 48B bus take to get from Markham to Timberley? Can I get the number 49 bus from Markham at 12:00 on Wednesdays? How long does the number 48B bus take to get to Holden Bridge from Timberley? Can I use this timetable at the weekend? Why? / Why not? Which bus is quicker if I want to get from Markham to Champerdon? By how many minutes? What time does the 09:45 bus from Holden Bridge arrive in Champerdon? Which bus do I need to take to get to Timberley, arriving in the morning at around eleven? Can I get the number 48B bus from Holden Bridge at 08:40 on Mondays? Does the number 49 bus go to Timberley? How long does the number 49 bus take to get to Champerdon from Markham? It’s Tuesday. What time is the next bus to Timberley if I’m in Markham and I want to leave after 2pm? How long does the number 48B bus take to get from Holden Bridge to Champerdon? What time is the next bus to Holden Bridge if I’m in Timberley and I want to leave after 3.40pm? Which route is the shortest? How many minutes does it take? What is the best bus to take to Champerdon if I’m in Holden Bridge and I want to arrive at around 10am.